Jim Dodson of Jim Dodson Law became a client in 2007. After a brief hiatus looking for “greener grass” (read more about that here), Jim came back to FWM, and he hasn’t looked back. As with any attorney, Jim wanted his website to do one thing: get him contacts. And not just any contacts, but genuinely interested, serious clients with the kinds of cases he loves to take on. To help him achieve this goal we incorporated the following features into his website, all of which have helped him increase site traffic and secure more valuable cases. 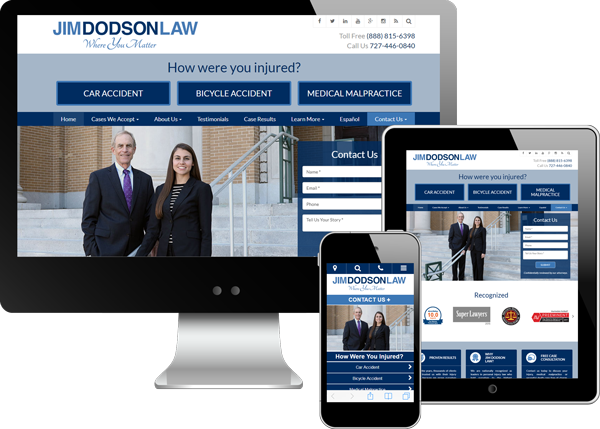 What we did: Unlike most attorney websites, the first thing you see on Jim’s site aren’t videos of him, but videos of his clients. Their stories are powerful and they speak to the work he does, so it was important to Jim that they were featured prominently on the website. Why does it work? Client testimonials, especially video testimonials, are powerful converters. When prospective clients hear the stories that Jim’s clients are telling they see themselves. They think, “Oh! This guy is just like me. He was hit by a car on his bike, he got hurt, and this attorney helped him win his case.” A viewer who feels this way is more likely to call. What we did: Jim is highly involved in his community. He is passionate about preventing cycling and pedestrian accidents and also runs several charity campaigns, including Cars for Moms, Bikes for Kids and the School Crossing Guard Recognition Program. To help him highlight these important causes, we equipped his site with several easy-to-find and easy-to-use buttons. Why does it work? The buttons make it simple for members of the community to find events or programs they are interested in; Jim wants to make it easy for those seeking help or wanting to give to his charities to do so. As a bonus, the content for these programs drives traffic to Jim’s website, increasing site traffic and boosting name recognition. What we did: Partnering with Ngage, we gave Jim a highly effective, easy-to-use chat feature. Not only does a chat feature pop up upon entering the site, a scrolling sidebar is present on each page. Why does it work? Chat is one of the best features an attorney website can have. It allows potential clients—who are often anxious about calling—to type in their questions and get immediate answers. And the benefits of chat don’t end there. Jim is able to view all chats, allowing the attorney to know exactly what potential clients are asking. This information is invaluable as it helps guide the content he adds to his website and helps him better understand the immediate needs of his audience.